Back in the late 1980’s, Madonna – the singer – wore crucifixes as fashion accessories. Within five minutes, teenage girls all over the world were aping her. Shane Lynch, of Boyzone, has been snapped wearing Rosary beads as have Christina Aguilera, Shakira, Rihanna and Kelly Osbourne. Catholics have registered their discomfort with symbols of their faith being used as frivolous fashion accessories. 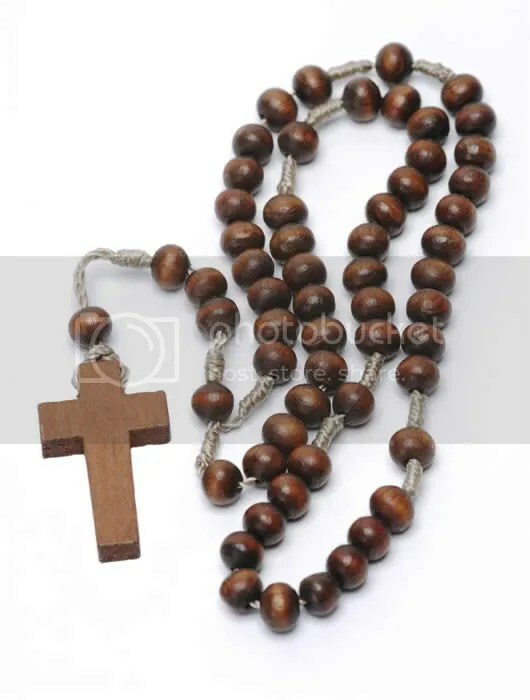 Indeed, in the convent where I went to school, we were expressly forbidden from wearing rosary beads, because they were just for praying with. This direction appears to be based on Canon Law, which states “Sacred objects, set aside for divine worship by dedication or blessing, are to be treated with reverence. They are not to be made over to secular or inappropriate use, even though they may belong to private persons”. In the past month, two designers have fallen foul of Hindus for depicting deities on their clothing. Australian swimwear manufacturer, Lisa Blue, apologised to members of the Hindu community at the beginning of May: An image of Goddess Lakshmi appeared on items of its apparel at Rosemount Australian Fashion Week (RAFW) in Sydney at the end of April. In the past few days, design house Manish Arora has removed images of leggings, miniskirts and harem pants from its website following complaints about the depiction of Lord Shiva on them. Members of the Hindu community were outraged that images of revered gods were represented on clothing made to be worn on the lower parts of the body. But do those who get their knickers in a twist over the wearing of traditionally religious symbols as fashionable accoutrements need to lighten up? Does it matter? Should they be grateful that their religion is being celebrated – no matter what form that celebration takes? Should they rejoice at the fact that their religion is reaching a wider audience? Or is their outrage justified? What do you think? Like the vast majority of people in this country, I was born into a Catholic family and was brought up as a Catholic. However, as I have not considered myself a Catholic for many years, and putting down “liberal agnostic who sometimes attends services at the Unitarian church” doesn’t seem quite right, I’m going for “no religion” on the census form next month. In a country that still essentially uses baptismal records as an excuse for not providing totally secular, non-denominational education, I think it’s important that those of us with no formal religious belief or none at all make our voices heard. on the question of religion the enumerators have been instructed to guide people to fill in the form to reflect their background rather than their current position. How does this help us plan for Ireland’s future? imagine a survey on car ownership. The question “Do you have a car?” is not asked; the survey goes straight to “What type of car do you have?” And then, someone who has no car is encouraged to say they have a Morris Minor because, way back, it was the traditional family car. What do you think? Have you encountered CSO staff giving such advice? And if they want our religious background, how far back do they want us to go? Parents? Great-grandparents? Prehistoric ancestors? Maybe we should all go for “sun-worshiper”….